I admit it. I started falling into believing that the Rangers had turned the corner. They had gone past the .500 mark, jumped up in the conference standings, solidified their defense, showed some more aggression (a fight starring Wade Redden, for God’s sake) and started getting increased and balanced scoring. Memories of the start of the season flashed in front of my eyes as I watched the goal lamps light and light and light again – 14 times over 5 periods. But that surge disappeared under a hail of fists from Carcillo on Marian Gaborik at the Wachovia Center on Thursday night. While most of us thought (or realistically, hoped) that the Rangers’ offense had found a groove, the Philadelphia Flyers exposed the shortcomings of that offense, and worse, exposed the lack of grit and team heart that we have known has been missing for several years or even decades from the Broadway Blues. Ray Emery, in his 3rd start since abdominal surgery, “outdueled” Henrik Lundqvist 2-0 at the Wachovia Center. Truth be told, the game was not that close and Emery could have just as easily earned that shutout from his hospital bed than stationed in goal. The official recap is here. To Henrik’s credit, for the 11th straight game, he allowed 2 or fewer goals. To the Rangers’ discredit, they were shut out for the 2nd straight game by the Flyers. Even though they scored a goal late in the 3rd, it occurred right after the final horn sounded thus preserving Emery's shutout. In some ways, that goal would have made the score respectable and would have been totally undeserved. So now the Rangers have not scored for nearly 150 minutes against the Flyers. behind in traveling to Philly. The game had some unfortunate symmetry - the Rangers’ ineffective fisticuff ineptitude in the 2nd period was sandwiched by two periods of offensive ineptitude. The Rangers needed to come out flying in the first to maintain their recent momentum and get the Flyers off balance. 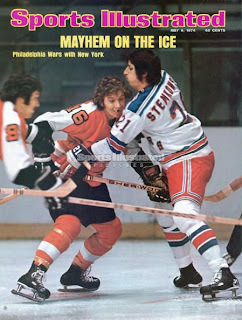 But the Flyers wasted no time disrupting the Rangers’ flow. You could sense early on that the Rangers had no timing or momentum and it’s not for lack of trying, it was attributable to the Flyers’ exploitation of their size and territory. The Flyers’ initial score was created by a tantalizingly slow pass from Chris Pronger in front of the net that traveled up the center of the ice to a streaking James van Riemsdyk at the red line. Henrik stopped the breakaway attempt but Marc Staal failed to mark him and he was able to get the rebound, make a move and backhand the puck over the defenseless goalie with 4:50 to go in the first. At that point, I knew if the Rangers did not score quickly, that goal might stand up. Lack of Heart on Aisle 2.
over the ice during the second period. In the second period, the Flyers decided to throw their weight around seeing that the Rangers were no offensive threat. With nearly 6 minutes gone, a scrum developed by the Philly goal and as Brandon Dubinsky and Ole-Kristian Tolleson battled. At that point, Dan Carcillo, the Flyer’s 21st century of Dave Schultz, decided that he needed to exercise his manhood by targeting Marian Gaborik. Marian took the bait and dropped his gloves and took the inevitable pounding. The Ranger players were spectators and did nothing to protect their only legitimate scorer. Dan Girardi, standing nearby, was the guiltiest but was fearful of drawing another penalty because he knew that Dubinsky had just been tagged with one. Is this what Tortorella’s system has wrought – players are afraid to be hockey players? Tortorella, the Carcillo of coaches in picking on beat reporters, does not let his players play to their strengths – witness the season-long (until recently) emasculation of Sean Avery. And other teams are well aware of it and take liberties. 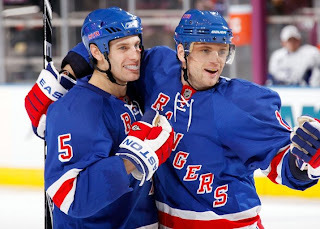 targeted Gaborik in order to stop the Rangers. Avery decided it was time to defend his team as he fought Scott Hartnell and then Carcillo just before the end of the period. Unfortunately, the Rangers were not energized and Gaborik took an ill-timed slashing penalty with a minute to go. With only a couple of seconds to go in the second period (2.5 seconds to be precise), the Rangers could not clear their zone and Marc Richard’s shot from the blue line found Marc Staal’s right skate and deflected behind Lundqvist. The game was over, the Rangers’ fight was over. Another lost opportunity for points against a team pursuing them in the standings. The third period started off with a fight between two Aarons Voros and Asham but then the Rangers whimpered away for the remainder of the game. Belated payback. Avery takes on Carcillo. Much has been written about the fights during the game and the post-game “fight” between the Ranger’s coach, John Tortorella, and Larry Brooks, the opportunistic scribe at one of the NY tabloids. See the post below for the YouTube clip of Tort’s press conference (and I highly recommend reading the comments to that post as well). Fans on blog sites have savaged Dan Girardi for looking the other way during the Gaborik fight. Girardi has realized his mistake. Meanwhile, the Rangers’ tv team apparently has no concept about what real hockey is about as they sanitized the events unfurling before their eyes even to the extent of extolling Girardi's efforts during the game. Forutnately, I was listening to the game on radio as Dave Maloney groaned and ranted about, as the play occurred in real time, Girardi’s failure to come to Marian's defense. Who do I give more credence to -- a former Ranger captain about proper decorum or the homer pansies sitting in the tv booth? 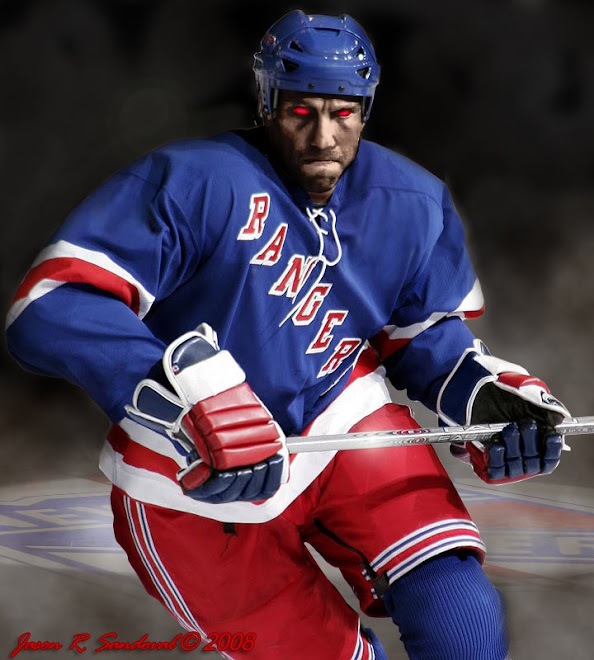 It’s amazing that the Ranger organization would subject fans to such idiocy – we are not blind. Do I have to start to hope that VS or NBC carries all Ranger games? Girardi after Dan scored against Tampa on Tuesday. Girardi was the first to avoid jumping in to protect Marian. Back to the lack of physicality – for all the criticism of Dan Girardi – no other Ranger moved in as well. But they all had something to say AFTER the game. Really -- what do we expect – the Rangers are a small team that relies on speed and finesse to succeed. Montreal and Tampa Bay put up the slimmest of opposition and yielded wide swaths of ice, so it was no surprise that the Rangers dominated. But when teams challenge the Blueshirts on breakouts or jam them at the blue line or clog the neutral zone, the Rangers cannot succeed. They are not big or mean enough to compete. They try but they only excel when unchallenged and show frustration at the first or second signs of physical opposition. sustained any pressure on Ray Emery all night. As Thursday’s game demonstrated, the Rangers simply do not have bangers on the blue line like Pronger and they don’t have large wingers like Richards the way Philly does. They don’t have physical intimidators that police the ice. 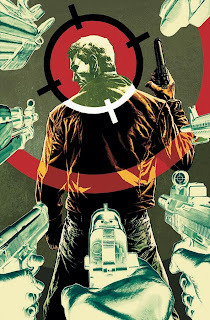 Avery has a target on him. Voros tries but he is no Colton Orr. Brashear is not even Voros (who also has outscored the Donald). Add all this up and you can see why the Rangers will not win a playoff series against Philly or New Jersey or Buffalo or Washington or Pittsburgh or Ottawa or probably any Western team. By game 5, the Rangers are either beaten up or worn down as we saw in last year’s playoffs. Thank goodness the Rangers get to see Montreal again on Saturday night affair in Quebec for Hockey Night in Canada. Let's see whether the Philly game is an aberration. Let's see what happens the first time that the Habs take liberties in front of their own home crowd with Henrik or another Ranger. Last Sunday night's game at MSG was a physical affair that the Rangers ended up dominating because Montreal cannot back up its hitting with any defense. Can the Rangers take their MSG scoring show on the road and erase Thursday night's performance? It will go a long way of showing how truly resilient the Rangers are and whether the Flyers game will have any longlasting effects.